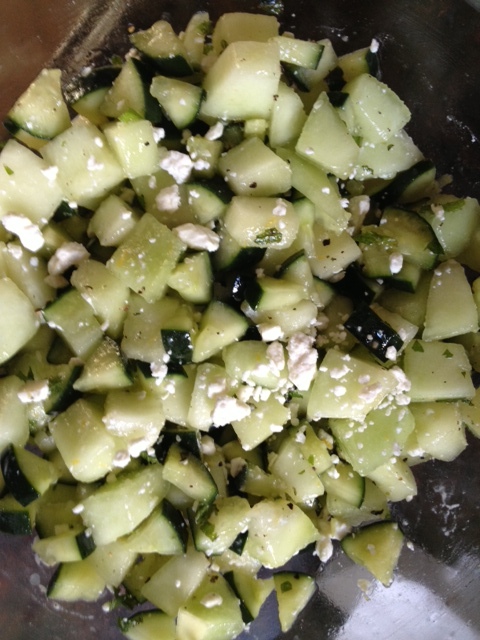 Cucumber Melon Salad | Om nom nom! I was surfing around for interesting salad ideas for our Memorial Day cookout, and this one caught my eye on Chowhound. It seemed like a pretty nifty one, and I really liked it. Very refreshing and easy. Plus I love anything that includes cucumber and mint, so there you go. I would definitely repeat this with any number of grilled main dishes for a nice summer side salad. Place the lemon zest and juice, measured pepper, and salt in a large bowl and whisk to combine. While whisking continuously, add the oil in a slow, steady stream until it’s fully incorporated. Add the melon, cucumber, and mint and toss to combine. Place the bowl in the refrigerator and chill until the flavors meld, at least 1 hour and up to 2 hours. Using a slotted spoon, transfer the salad to a serving platter, leaving any liquid in the bowl behind. Top with the feta and season with more pepper.